FLEET OPTIMIZATION “A lot of operators view hedging in futures as mysterious, and it makes them nervous. We’re trying to demystify it, to get them to use hedging as a way to control their budgets.” –Richard Larkin, President of Hedge Solutions, Inc. fuel or about 50 percent of fuel consumed,” WSF deputy chief Jean Baker said. “We did this with our fuel supplier through fi xed-price physical contracts. The prices we paid were less than what we’d budgeted for those gallons.” Sav- ings, in this case, were considerable. Fuel used by WSF isn’t hedged in the futures market now. “We’re working to get fi nancial hedging contracts in place,” WSF spokeswoman Joy Goldenberg said. Lamson said The Steamship Authority will have another ULSD-fu- eled ferry built soon. When asked about LNG, he said it’s the vessel fuel of the future. “LNG is popular in Europe, and we’ll be considering it down the road,” he said. LNG is used to fuel ferries in Norway, Japan and Argentina. 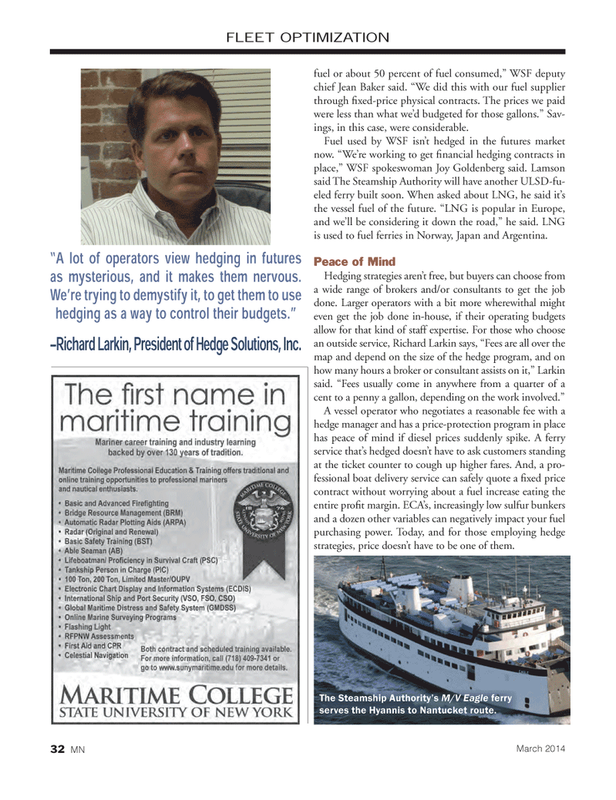 A vessel operator who negotiates a reasonable fee with a hedge manager and has a price-protection program in place has peace of mind if diesel prices suddenly spike. A ferry service that’s hedged doesn’t have to ask customers standing at the ticket counter to cough up higher fares. And, a pro- fessional boat delivery service can safely quote a fi xed price contract without worrying about a fuel increase eating the entire profi t margin. ECA’s, increasingly low sulfur bunkers and a dozen other variables can negatively impact your fuel purchasing power. Today, and for those employing hedge strategies, price doesn’t have to be one of them. The Steamship Authority’s M/V Eagle ferry serves the Hyannis to Nantucket route.